Steampunk costume? what are you wearing? Fancy a Steampunk ‘I love data’ tshirt from me? There’s been a lot of interest in the Steampunk theme this year for SQLBits. What is steampunk? I’m writing this blog for the people who have been asking me. I’m thinking of printing up some Steampunk style tshirts with ‘I love Data’ on them. Is anyone interested? I’m happy to print up to 10 tshirts for free and give them away. First come, first served! Stop Press: This is a gift from me (not a PASS gesture, or even a SQLBits gesture. I’m trying to do something friendly and community-minded and I’m paying out of my own pocket. To this end, I’d like to simply give this gift to people who are attending SQLBits only. It is not a company offer or an ad; simply a gesture. If people email me to me by Friday 4th July, then I will work out how many I can get printed and I will make it happen. If you’d like to design a steampunk print to go on the tshirt, I’d love to see your design! So, to respond to this, please email me at jen.stirrup@copper-blue.com and I will see what I can do. I come up with this idea because I like wearing tshirts with the word ‘data’ on them and it means I play it safe with a Steampunk top that I feel comfortable in. What is steampunk? Well, it seems to mean different things to different people. I have had different explanations. My friend raised eyebrows and said ‘niche… fetish’ and looked at me in bewildered horror 9and a slight tinge of fear) when I mentioned it to him. Other people have said ‘Alice in Wonderland’ and talked about mixing Doctor Who with artefacts such as goggles. It is hard to get to the heart of the design, but it seems to mix past and present, factual design with fictional genres. There is an element of machinery and design. How do I define Steampunk – if it can be defined? I think I see it as an aesthetic which is a unique combination of modern vibe along with a retrotechnological focus. That probably doesn’t help you to decide what to wear that is Steampunk though, does it? When I first had a look at steampunk costumes for women…. um, not for me. It was hard finding something that I liked. I’m an edge case though. I am on the wrong side of forty and I dress to hide cankles and varicose veins. If basques etc is your thing… great….I’m glad you have a waist! I will stick to wearing tshirts with the word ‘data’ on them, quite frankly. So, if you are stuck, attending the SQLBits party on the Friday night, and not sure what to wear… please let me know what you think of my suggestion and feel free to get in touch.. If you have been to Paris, you may well have been to the Art et Metier metro stop, which is designed in steampunk style. Here is another picture from Wikimedia (I use it so that I don’t get into trouble!) 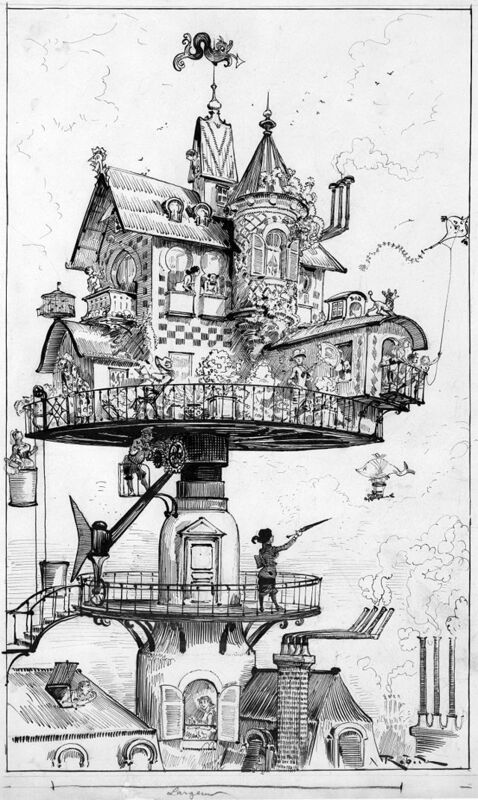 by the artist Albert Robida.